The following insights uncover some of the hidden functional gems that will help you work more quickly and effectively as a CRM Outlook user. The best part? They're useful whether you’re in Sales, Marketing, or Customer Service. Setting up the CRM Address Book in Outlook will allow you to search for and email contacts that you don’t personally own in CRM. All it takes is a quick modification to your existing settings. See below. 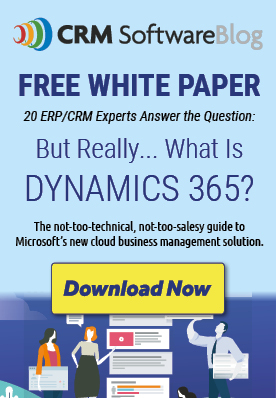 Quick note: This won’t change the security model you already have set up in CRM. Only the contacts you have permission to view will be available. 5. To access the CRM Contact list when composing an email, open up a new email. You can personalize your Outlook folder structure to make key folders in CRM available within a click. These folders -- like Opportunities, for example -- can be mixed in with your standard mail folders like your Inbox. 1. In the bottom ribbon of Outlook, select the ellipsis and click on Navigation Options. 2. Using the Move Up and Move Down navigation buttons, push Shortcuts to the top of the nav list. 3. Customize: In the Shortcuts navigation pane, right click and select New Shortcut Group and name this group. 4. Then, right click on this new group and select New Shortcut. 5. Work your way through the various CRM and Outlook folders to pick your shortcut and then click OK. In the same way that you can pin views in Dynamics CRM, you can also leverage this ability from within Outlook so that you can have quick access to your most important CRM views. 1. Within Outlook, select a Target CRM Entity. 2. In the ribbon on the top, select the New Tab icon > Select a View. 3. With this new tab created, click the pin so that it is pointing downward, not sideways. Example below. Speed up the process of filtering CRM records in Outlook using the “Group by box” functionality. Quite similar to using a pivot table, this will enable you to drag and drop groupings to view your data differently. 1. Go to CRM with Outlook, select a target entity. 2. Within this entity, pick a view. For example “Address 1: City.” Right click on this column, like below. 3. Within this menu, select Group by Box. A drag and drop section will appear. 5. This will group your data accordingly. Now, you can easily evaluate your data based on the fact that it’s grouped by city (or whichever column you decide to work with). Another handy Outlook feature that can apply to CRM within Outlook. Colour categories allow you to apply a colour to certain records in a meaningful way so that you can know how to best interact with them. 1. In Outlook, select a pinned view. 2. Look for the categories column in this view. 3. In the record you wish to categorize, right click the category square and pick a colour. For example, blue might be for opportunities that you need to follow up with this week. Simple, but useful! Hopefully these tips will help improve your experience as a CRM Outlook user. Feel free to share any additional tips that you've come across in the comments section! To receive more Dynamics CRM tips like those above, sign up for the Catapult newsletter.